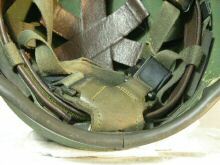 1. the band around the rim of the helmet is no longer black plastic. 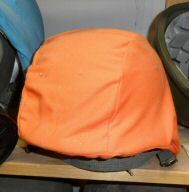 It is now a harder material and the same colour as the rest of the helmet. 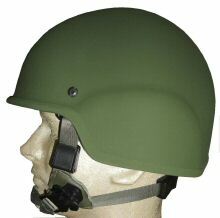 2. there is a foam rubber pad over the screw that holds the chin strap assembly to the rear of the helmet." 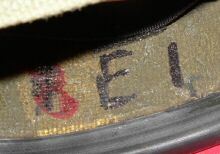 Original service version LEFT - New version RIGHT. 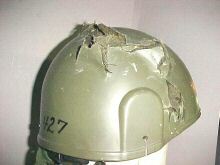 This helmet caused some surprise when was presented on Ebay in January 2013. 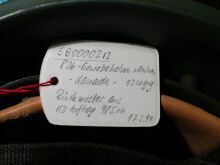 The seller was in Austria, and had a number to hand. 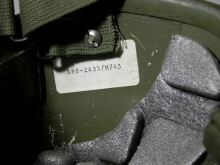 Roger Lucy - "My best guess is that it may be intended for the Multinational Force and Observers in the Sinai Multinational Force and Observers which is a non-UN observer mission set up after the Israeli withdrawal. 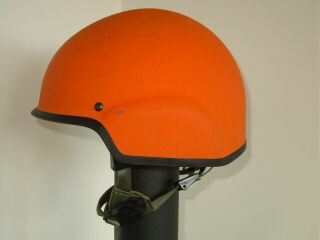 I have an orange-coloured PASGT cover for them, although making a dedicated orange helmet seems a bit extreme. 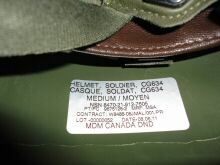 Also the helmet lacks any CF contract numbers or NSNs, also the label is unilingual which is a no-no for Canadian DND procurement. 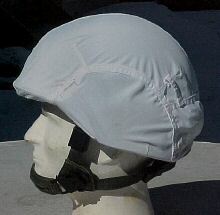 It may be a sales sample aimed at a foreign or security market. 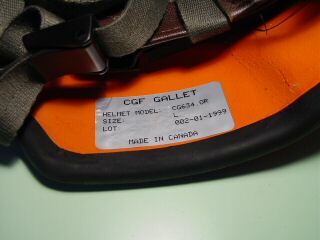 Gallet (before MSA gobbled it up) was trying to shop the CG634 around (I recall Gallet having a stand at the CANSEC equipment shows here in the early 2000s but the helmet is designed around Canadian kit (body armour, respirator comms), and I am not aware of any foreign procurement of the CG634." 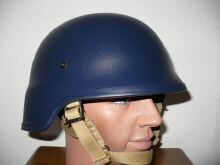 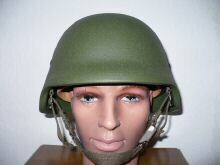 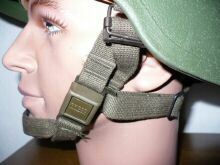 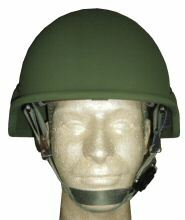 Chris Johnson contacted the seller for more information; "This is the information that I just received from the seller (he is located in Austria) - "The helmet is designed for international civilian organisations. 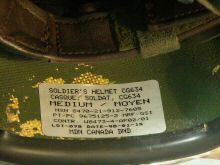 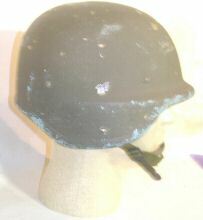 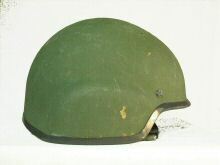 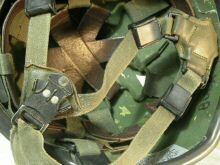 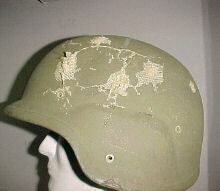 I know that this helmet was used during the war in Kosovo 1999. 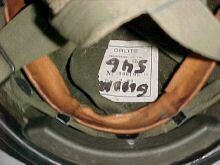 There it was important to distinguish the different actors. 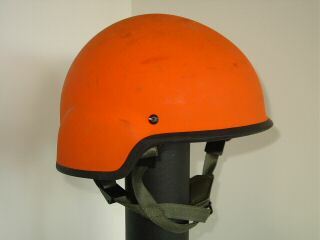 Apparently many helmets of those organisations never left the storage since they are in perfect conditions." 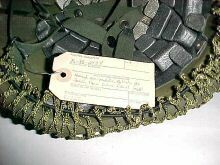 Roger Lucy - "That's very interesting, it seems plausible.Of course if they were shipped to Europe in back then, Gallet should have applied for an export permit, and in fact failed to seek one (I was looking after Canadian strategic export controls at the time so am in a position to know). 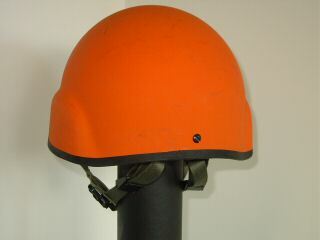 The use sounds plausible.I don't know what civilian organization uses orange. 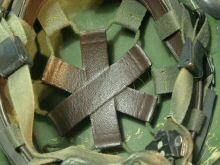 I present a PASGT cover made for service with the Multinational Force and Observers. 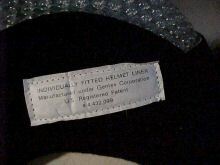 It's well made, along the lines of an issue cover, with velcro fastened tabs and all, but it's not factory-made, presumably because demand is too low for a production line. 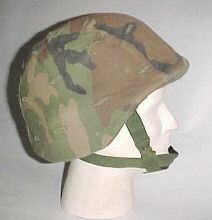 "Here are photos of the Barrday helmet in several variations; it was made of Spectra (except the odd example which has PASGT liner and chin-strap which seems to have been made of kevlar). 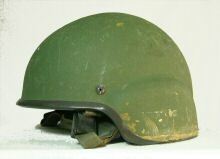 Following an acquisition process, begun in 1981, which led to trials of various helmets types, the evolution of a helmet design was put out to tender. 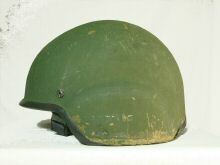 The winning bid went to the Barrday Co. of Cambridge, Ontario, which between 1988 and 1990 produced 3,625 helmets for ballistic, engineering and user trials. 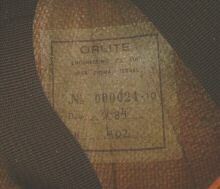 Bodies were fabricated from both woven or unidirectional Spectra (Dyneema) fibres. 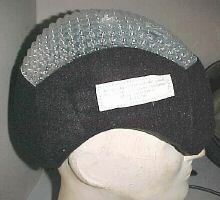 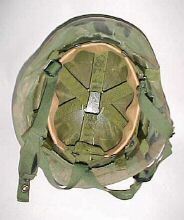 While the Barrday helmet seems to have performed well ballistically, the field trials, which took place in 1989 and 1990, identified significant shortcomings with the foam liner (based it seems on that of a hockey helmet), in particular severe discomfort from excessive heat build-up. 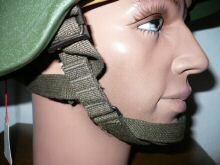 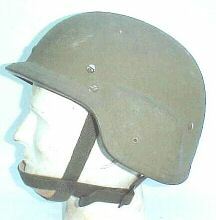 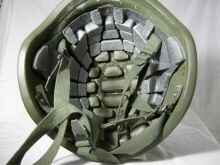 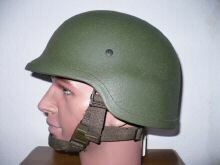 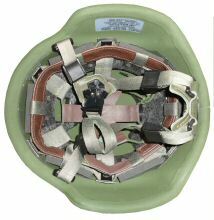 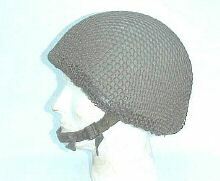 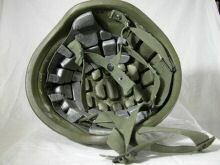 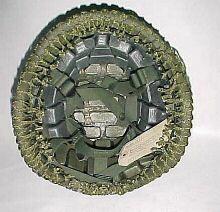 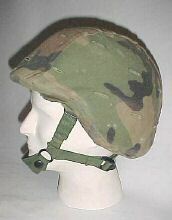 A number of the Barrday helmets (now designated P-2 Soldiers' Helmets) were retrofitted with M-1 cradle suspensions and new trails were held in 1991 (pictures of both types) . 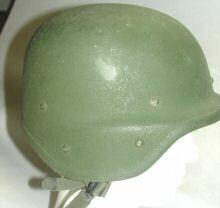 While the heat problem was resolved, and the helmet was almost fielded, the Barrday helmet proved incompatible with existing and future equipment, such as the C4 respirator, the Slimgard head-set, the C7A1 optical sight; night vision equipment and the new Canadian armoured vest. 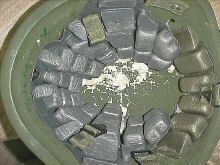 There were also quality control problems - reportedly "delamination" of the bodies under field conditions. 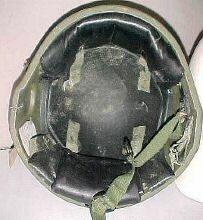 The contract was cancelled in 1992. 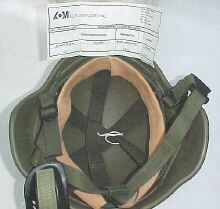 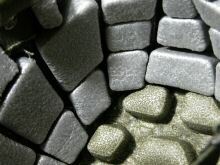 "ACM Composites Inc Rue Scott St.Jerome PQ 1/11/94 MEDIUM V50 m/s 660 1420 Gr." 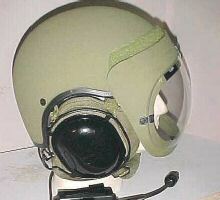 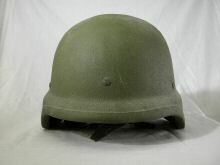 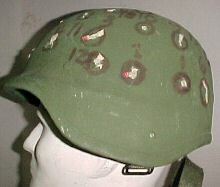 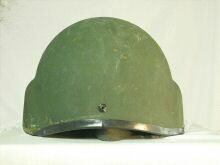 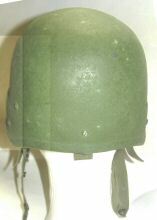 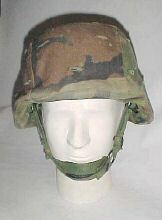 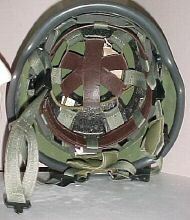 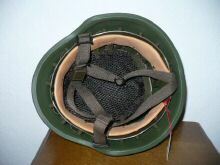 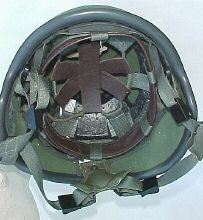 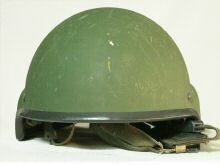 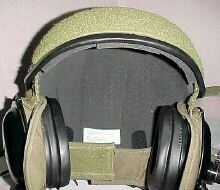 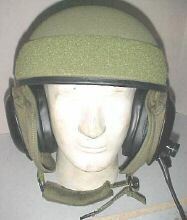 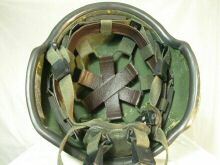 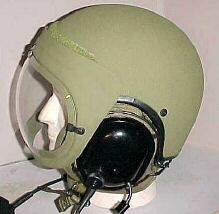 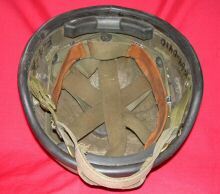 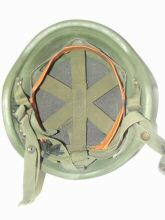 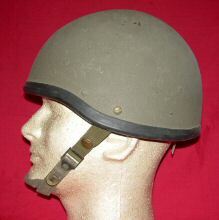 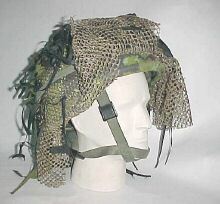 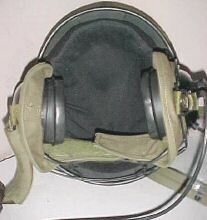 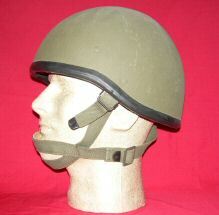 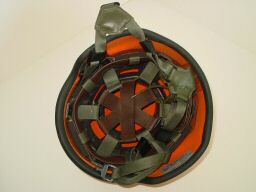 DH-197 naval helmet, made by Gentex. 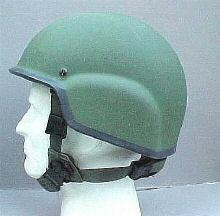 SCHUBERTH 826 - Police issue. 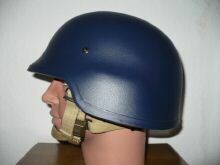 "Schuberth 826 in dark blue for the police. 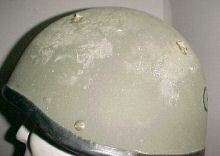 In and outside the shell has a smooth surface. 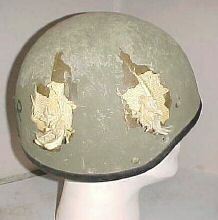 From Schuberth I have the information that only a limited number of this helmets were ordered by Canada. 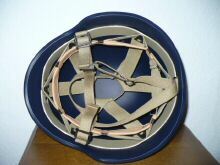 The sand coloured US style suspension is installed and fixed with non-ballistic screws. 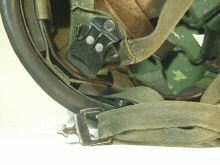 The chinstrap has no survival buckle. 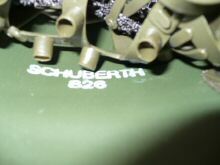 The shell has a white marking inside that reads SCHUBERTH 826 Gr (Gr is short for Größe - 'size' in English. 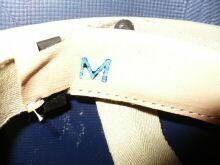 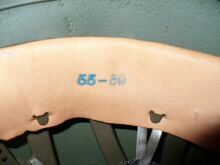 In the leather band is a blue M to show it is size medium." 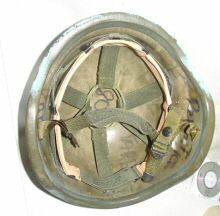 "Here we have a Schuberth 826 sample helmet for a contract from 17.02.1994. 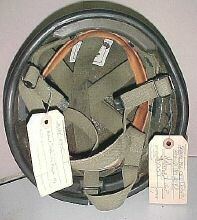 So it seems that Schuberth had a contract from Canada.The label reads that the shell was made with 13 layers of the ballistic material. 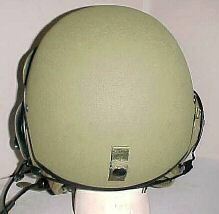 The paint is dark green with a rough outside. 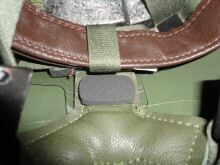 The NOSHA suspension is fixed with non ballistic screws. 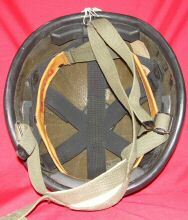 The chinstrap has no survival buckle. 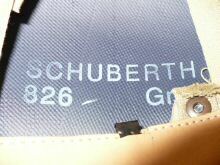 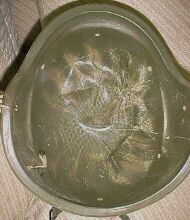 The marking inside the shell is in white and reads Schuberth 826." 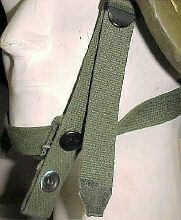 "An OR402 with a modified chinstrap -- two point vice three point attachment. 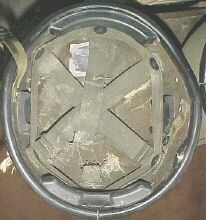 A redundant attachment ring in the rear does not exist so it was puposely made this way. 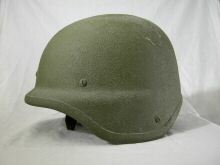 This helmet was tested by Canada's Land Equipment Testing Establishment (LETE)." 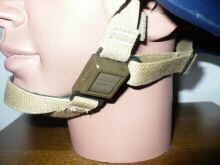 "OR402 tested by LETE with a standard chin strap configuration. 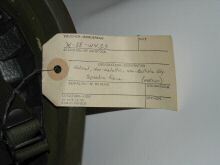 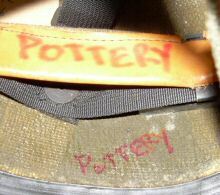 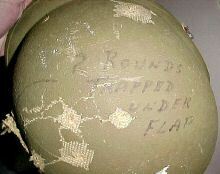 Note the soldier's name and the unidentified inscription. 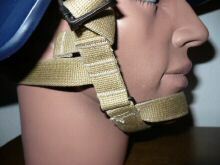 Also note that the suspension straps are black." 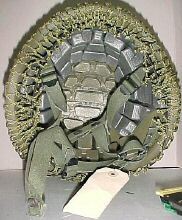 "A batch of photos of Mk.6, Orlite 401s and PASGTs used in trials in October 1984, including ballistic tests, and also tests to determine the best harness - so you see an Orlite with a PASGT strap and PASGTs with Orlite and Mk.6 harnesses. 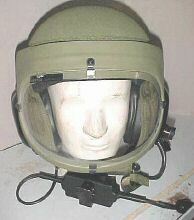 Overall, it was concluded that a hybrid of the Israeli helmet, with a revision of the US internal suspension and a British-type three-point chin-strap, with a direct-snap quick release feature (but no chin-cup) would best meet the Canadian Forces requirements. 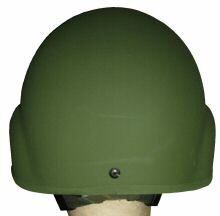 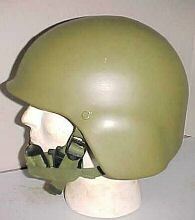 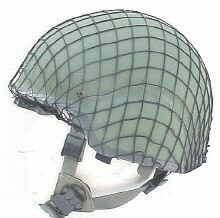 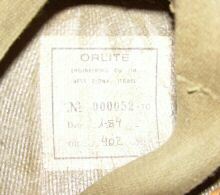 In an ideal world, not dominated by the need for "defence industrial benefits"(Canadian for off-sets) the Orlite (which was already coming out with a revised quick-release chin-strap) could have been bought off-the-shelf, and Canadian soldiers would not have had to wait another 12 years for a modern helmet."